Iris missouriensis commonly named Western Blue Flag, perennial that grows at higher elevations, in mountainous areas of California. Native to western North America, it is found in moist grassy places and wet meadows. This perennial growing to 0.75 meter by 1 meter. Iris missouriensis rivals the most beautiful orchid. The flowers are consisting of 3 sepals and 3 petals. 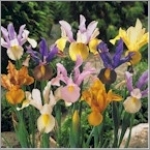 Delicate blue-purple to lilac flowers with a dark yellow-orange stripe down the middle of the petal. It is in flower from May to June. Iris missouriensis typically has leaves and flower stalk about a foot tall, with a 3 inch flower, but it is not uncommon to find Iris growing to 2 feet tall. 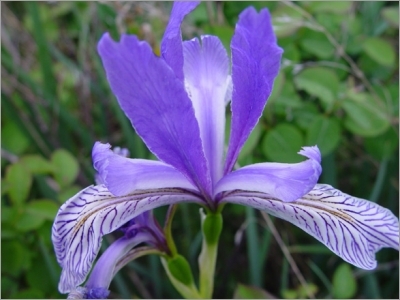 The duration of Iris missouriensis flowering is determined by the amount of late Spring snow and early Summer rain. The flowers are hermaphrodite, they have both male and female organs. The plant is self-fertile. Iris missouriensis may be found with either simple or branched stems. The leaves are mainly basal, linear, sword-shaped, green, 20-40 cm long, mostly 5-10 mm broad. The plant spreads by means of its modified stems, rhizomes, which are located below the soil surface.